Fall is in full swing and so are Albion’s fall athletic programs. Between nationally-ranked teams and MIAA Athlete of the Week honors, the Britons have certainly made strides heading into the latter part of the fall sports seasons. In head coach Craig Rundle’s final season, the Brits stand at 4-1, dropping their first game on Homecoming against Hope with a final score of 29-24. Despite the most recent loss, the team has had their strongest start to the season since 2015, in which they tied for the MIAA title with a record of 9-2 and advanced to the first round of the NCAA tournament. Wixom, Mich. Senior quarterback Kyle Thomas currently stands at 1,426 total passing yards for the season, good for 24th in the NCAA Division III rankings. Fellow seniors Doug Freeman from Niles and Andrew Fabry from Grosse Pointe have racked up 464 total rushing yards and a 100 percent field goal percentage, respectively. 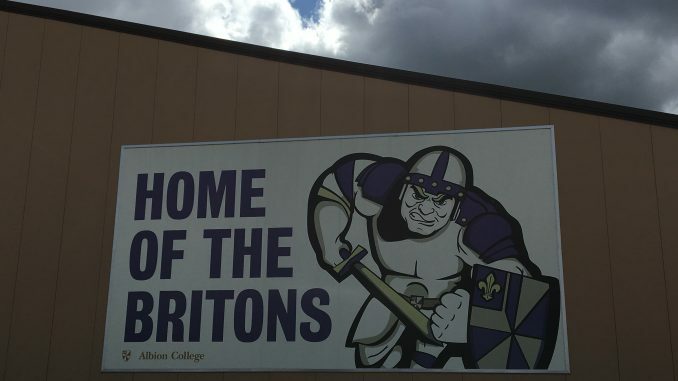 The Britons look for redemption at home this weekend as they take on a Kalamazoo College team that is seeing their best start in years at 5-0. The VolleyBrits stand at 10-7 overall and 3-2 in conference play. Seniors Taylor Rosenthal (Vicksburg) and Marie Pregenzer (Kalamazoo) have led the squad in kills, each with 173 and 155 as the season stands. Monica Shuk, a standout libero from Milfrod, has also had 278 total digs so far in her senior season. The Brits are poised to once again make the MIAA tournament, which will likely feature conference foes Calvin and Hope, who are ranked 1st and 18th respectively in the American Volleyball Coaches Association national polls. After taking on the Flying Dutch on Wednesday Oct. 10, the Britons will take a weekend trip to Ohio for a quartet of matches. The women’s cross-country team seeks to crack the top 10 of the Great Lakes region after finishing 10th in 2016. Amherst, Ohio senior Cassandra Vince, who has already garnered the United States Track and Field and Cross-Country Coaches Association National Athlete of the Week award, has been a strong front-runner for the Brits, while transfer sophomore Darby Kellogg of Walled Lake has also turned in early standout performances. The men’s squad is looking to advance to the NCAA Championships as a team for the first time since 2010. They have been ranked as high as second in the region and 25th in the nation per USTFCCCA rankings. Junior Kiehl Smith has been a consistent leader for the team, bringing together a tight pack of veteran runners in scoring position. Both teams travel to Oshkosh, Wisconsin this weekend for the Kollege Town Sports Invitational. The women’s golf team ended their fall season by qualifying for the spring round of the MIAA tournament this past weekend. The winner of this next tournament will determine the conference’s automatic qualifier for the NCAA National Tournament. Seniors Megan Moco (Grosse Ile) and Madison Kroetsch (Novi) garnered second team All-MIAA status, finishing this portion of the season with stroke averages of 83 and 83.4 respectively. With only one match left in the fall season, the men’s golf team finds themselves 23 strokes away from fourth place, which would qualify them for the Spring tournament. Canton sophomore Justin Kapke continues to ride the momentum from his breakthrough first year with a stroke average of 77.6, with teammate and fellow sophomore Soti Michalos of Bloomfield Hills not far ahead with 77.3. The Brits stand undefeated in conference play, having beaten St. Mary’s, Trine and Alma. They look to continue their streak on Wednesday Oct. 10 against Kalamazoo. Senior Samantha LaRocca (Clinton Township) and first-year Clare Kelley (Plymouth) have been consistent top goal-scorers, netting five and four respectively. Having just started conference play, the men’s squad is looking for their first MIAA win of the season. Grosse Pointe Woods senior Will Colborn has found the back of the net five times this season, while sophomore Alex Spratte of Canton has started an impressive sophomore season with four total goals. Women’s tennis recently competed at the Intercollegiate Tennis Association Central Regional Championship, where first-year Alise Haddad won a pair of backdraw matches. Senior Lauren Solano (Trenton) also garnered a first round victory before being eliminated in the second. The men’s team started their season with a number of single and double wins at the Hope College Invitational, as well as a dual win against Alma. Josh McGary (Macomb), Robert Joerg (Fremont, Ohio), Nick Kinachtchouk (Saginaw) and Israel Trevino (Lansing) have all netted singles victories, while Trevino and first-year Patrick Smoker (Kalamazoo) have won in doubles. Both teams return to dual action in early February. The Western riding team, under the leadership of new coach Adam D’Agostino, started off their season at Saginaw Valley State University this past weekend. Ottawa Lake sophomore Alex Carducci won both the reining and open horsemanship competitions, finishing as the individual reserve champion of both shows. Makenna Ware (Williamston) and Megan McFadden (Marshall) also had respective first place finishes in open and intermediate horsemanship. Although the swim and dive team are in the midst of preseason practice, a select few were able to compete at the College Swimming Coaches Association of America Open Water Championships in Lawrence, Kansas. Zeeland junior Mac Robertson finished 39th overall, completing the 5,000-meter course in 1:05:45. Leading the women was senior Katie Ferrero of Royal Oak, finishing in 1:15:20.